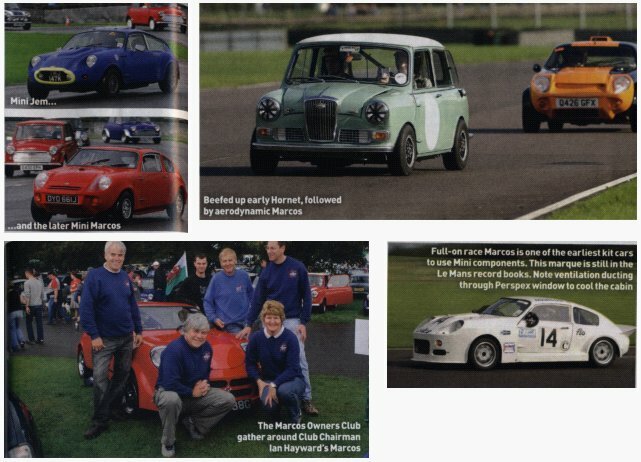 No fewer than four Mini Marcoses and a Jem are included in the four-page photo spread from Castle Combe, not to mention a Scamp, a Hustler and an Ogle. Photos by Gerard Brown. The "usual suspects" around Ian Hayward's car are (clockwise from left) Roger garland, Guy Hayward, Richard Porter, Howard Plant, Melanie Garland and Ian Hayward.